I haven’t got one single post about fish on this blog yet, which is a shame because I’ve been living in Edinburgh for a while now and, being in Scotland and situated right next to the sea, it’s obviously a great place for eating seafood. I admit that I’m a bit of a novice when it comes to fish as I don’t often cook it, although I do love eating it. I recently invested in a copy of the River Cottage Fish Book which has provided a good bit of inspiration. Flicking through it the other day, a photo of salmon tartare grabbed my attention. Since making steak tartare recently and appreciating it’s beautiful simplicity, salmon tartare obviously appealed to me. Steak tartare is a celebration of well-aged, tender beef that is full of flavour. 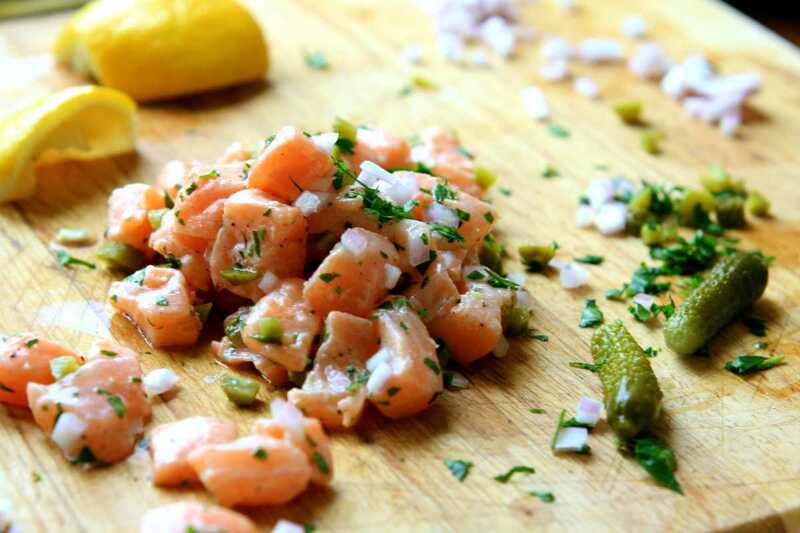 Salmon tartare is much the same: the piece of fish used must be top quality and as fresh as possible. Finding such a piece of fish was not going to be a problem in Edinburgh, and was particularly easy for me asArmstrong’s fishmongers, recognized by many as the best in the city, happens to be just down the road from my flat. “All of this was fresh this morning” he assured me when I told him I needed a piece of salmon as fresh as possible. On slicing it was clearly very fresh, the orange-pink flesh glossy and firm. Tasting it as it was, pure and unadorned, it already had excellent flavour. Hugh Fearnley Whittingstall uses Tabasco and Worcester sauce in his recipe which I chose to omit here as I think the amazing flavour of the fish shouldn’t be masked too much by additives. My version of the dish, I believe, includes enough extra ingredients to compliment and enhance the natural flavour of the fish without overpowering it. One of my favourite things about this dish is the magic worked by the lemon juice. As well as imparting sharp fresh flavour, the acid in the lemon juice affects the protein in the fish, causing a “cooked” texture on the surface of the meat. The acid denatures the protein molecules just as heat does when cooking, and as the brine did in my pig’s cheeks recipe. Pickling things in vinegar, again, has the same denaturing effect. All of these in a sense are just different ways of cooking meat. The advantage of using a method like this is that the fresh flavour of the raw meat does not change nearly as much as if you cooked it. The salmon will continue to “cook” for as long as it is left to marinate in the lemon juice. I would recommend no more than 5 minutes; this will result in a fairly thin layer of cooked-texture meat surrounding a lovely soft rare centre.